A stunning example of a well loved, classic, sportspack mini. It was registered on 21st of january 1998. It has covered only 35272 miles from new. It is fitted with a 85bhp tuning kit. It has the full v5, old mots, current mot may17, handbook and service record and two full sets of keys. Always garaged, never used in the rain. ROVER MINI COOPER. FEB 1993. 1.3 SPI. 1 FORMER KEEPER. 1/2 LEATHER COOPER INTERIOR. AIR CONDITIONING. 12" ROVER COOPER ALLOYS. FULL COOPER SPEC. REALLY CLEAN EXAMPLE IN GREEN AND WHITE. ​WILL COME WITH FULL MOT, SERVICE AND VALET. ROVER MINI MAYFAIR. COOPER A LIKE 1994. BIG SEAT MAYFAIR INTERIOR IN GREY. AIR CONDITIONING. ALLOY INTERIOR HANDLES. 1.3SPI. 6X12" STARMAG WHEELS. MANIFLOW EXHAUST. PLENTY OF RECIPETS AND PAST MOTS. COMES WITH MOT,SERVICE AND VALET. 9/2/1995. 1275CC INJECTION. 30627 miles. 2 FORMER KEEPERS of the same family. COMES WITH OWNERS HANDBOOK AND FULL SERVICE HISTORY. THE MINI HASN'T BEEN USED SINCE 2008 and has been dry stored. Genuine garage find. It needs recommissioning, checking over, mot and servicing. It wouldn't take much to make it perfect. FULL COOPER SPEC. 1/2 LEATHER INTERIOR,RED CARPET, ALLOYS, AIR CONDITIONING. COMES WITH HMRC CLEARANCE LETTER AND DOCUMENTATION FROM JAPAN. 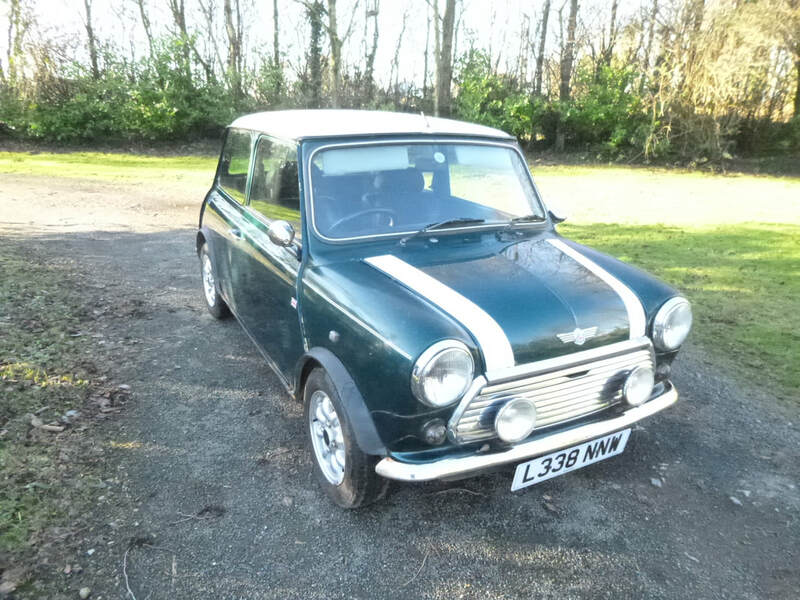 WILL NEED MOT AND A SERVICE AND THEN YOU CAN REGISTER THE MINI ON ITS 1ST UK PLATE. FULL GREY LEATHER INTERIOR, COOPER STYLE ALLOYS,AIR CONDITIONING,CD, WOOD DASH. ROVER JAPAN MINI- GREAT BODY WORK. 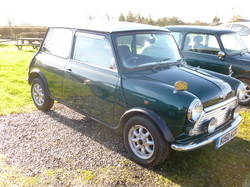 WE HAVE A COLLECTION OF MINIS THAT HAVE RETURNED TO THE UK FROM JAPAN. PLEASE MESSAGE FOR MORE DETAILS. 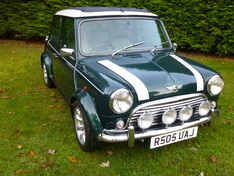 Mini Cooper - registered January 1994 in British racing green and white. This mini is a full restoration project. It needs inner and outer sills, door steps, o/s rear quarter and wheel arch repairs, rear valance replacing and repairs to the boot floor and n/s rear floor corner. The wings have been replaced and the paint isn't so great. The rest of the mini looks to be original. It has a good roof and gutters, good scuttle panel. The subframe is flaky and needs cleaning up and painting. Mechanically- its has a 1275cc single point injection engine that runs well but needs an oil change. The syncro's in the gearbox are good. Its has 31194 miles on the clock. All running gear is standard. It has full standard cooper spec:- Walnut three clock dash with cream instrument dials, 'big' black & red half leather interior- The driver seat has a repairable tear, 12" rover cooper alloys. original rover stereo, owners handbook, service portfolio and folder with receipts and plenty of old mots. Full v5 is present. AUSTIN MINI CITY E 1982. 1275cc. 34 year old white mini with lots of character. 5X12" SUPERLIGHTS,H4 WIPAC HEADLIGHT CONVERSION. CUSTOM CONSOLES DASH- CENTRE BINACLE 3 CLOCK DASH, REV COUNTER AND SPEAKERS. CARBON FIBRE FRONT DOOR CARDS- FULL ALLOY INTERIOR DOOR HANDLE SET. THE MINI WILL COME WITH 12 MONTHS MOT AND A SERVICE.